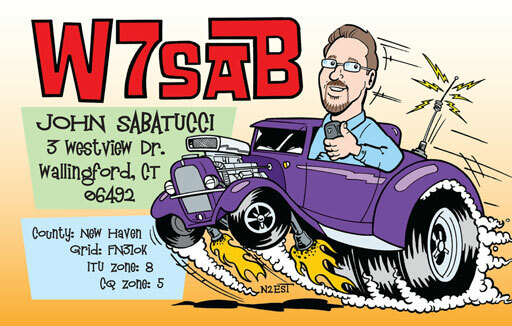 When John, W7SAB, told me he wanted a picture of his 1929 Nash hot rod on his QSL, I knew immediately how I would play it: His QSL would be an homage to Ed “Big Daddy” Roth, creator of Rat Fink and king of the hot-rod cartoonists. Drawing this card presented three challenges: Getting John’s likeness right, getting John’s car right, and making it look as if Roth might have drawn it. I think I got close. John’s reaction when he saw the finished product: “Awesome!! !” This one was a lot of fun to draw. This entry was posted in cartoon QSLs and tagged amateur radio, Big Daddy Roth, cartoon QSL, ham radio cartoon, ham radio humor, Hamtoons, hot rod, mobile operation, N2EST, QSL, Rat Fink, W7SAB. Bookmark the permalink.